Our 90,000 sq. 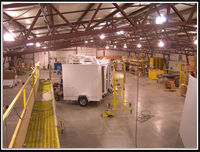 ft. facility in Howe, Indiana is equipped to handle a wide variety of facility trailer applications including restroom, shower, laundry and kitchen units. Providing quality working conditions to ensure that every unit produced by JAG Mobile Solutions is built to the highest standards. 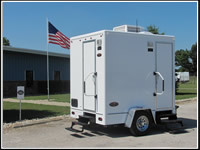 JAG Mobile Solutions Inc, located in Howe, Indiana is a superior supplier for the specialty trailer consumer. With upscale products ranging from restroom and shower trailers to mobile locker rooms, kitchens and more, JAG is making its mark on the specialty trailer industry by providing exceptional quality combined with expert workmanship and superior customer service. This commitment to quality not quantity is a departure from the industry’s typical mode of operation. 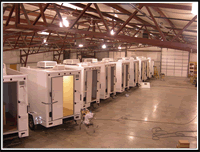 The JAG management group has extensive experience in designing, manufacturing and distributing various types of specialty trailers. The common thread throughout all of our employees is a commitment to total customer satisfaction. JAG is working closely with some of the premier consumers in the business to meet their individual needs, bringing them fresh solutions to their unique situations. These solutions are based on personal relationships formed with high ethical and moral standards. Our employees strive to provide our customers with the best possible products, information and support available in today's marketplace. We welcome the opportunity to meet with you in person either at our Howe Indiana facility or at yours. Our 90,000 square foot facility boasts an open door policy and we welcome all visitors to see what makes JAG Mobile Solutions different. For more information about JAG Moblie Solutions cooperative marketing program send an email to marketing@jagmobilesolutions.com or call (800) 815-2557.